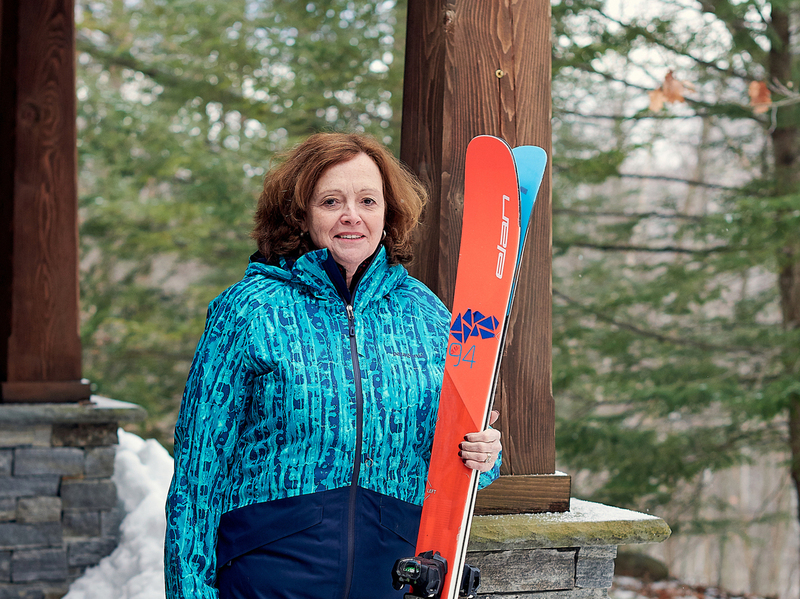 Refund For Skier Featured In NPR-KHN Bill Of The Month Story : Shots - Health News Ski buff Sarah Witter will get $6,358 back from her hospital and insurer after a review of her bill following the NPR-Kaiser Health News story about her case. Sarah Witter had two operations to repair bones in her lower left leg after a skiing accident last February. The second surgery was needed to replace a stabilizing plate that broke. Sarah Witter had to pay for a second surgery in June to repair her broken leg after a metal plate installed during the first surgery broke. On Friday, she got a more welcome break — a decision to refund $6,358 to her by the hospital and her insurer. Witter's experience was the subject of the Bill of the Month story from NPR and Kaiser Health News that was published last Tuesday. Witter and her insurer, Aetna, had racked up $99,159 in bills from a Rutland, Vt., hospital and various medical providers after a skiing accident last February. A surgeon at Rutland Regional Medical Center attached two metal plates to bones in her lower left leg to help them heal. Less than four months later, one of these plates broke, and she needed a second surgery to replace it. Witter, 63, ended up paying $18,442, mostly to the hospital, for her portion of the total cost for her care from the hospital, doctors, emergency services and physical therapists. After we contacted Aetna about these costs, the insurer noticed that Rutland Regional had billed Witter for the difference between what it charged for its services and what Aetna considered an appropriate price for the first surgery. Those additional charges are known as "balance bills" and occur when a medical provider isn't in the insurer's network and has no contract with the insurer. (Rutland Regional isn't in Aetna's network.) Our original story had calculated $7,410 in balance bills. Aetna said it contacted the hospital and negotiated a compromise in which the insurer paid the hospital nearly $3,800. The hospital waived the remainder of the charges to Witter that Aetna considered unreasonably high. "As part of her benefits plan, Sarah's claims in question went through a patient advocacy process that allows us to negotiate with the provider on the member's behalf to resolve any balance billing issues," an Aetna spokesman wrote. Aetna said it will negotiate disputed bills for any of its customers who request assistance, and also help schedule appointments, get services authorized and deal with other nonmedical complications. However, the Aetna spokesman wrote, "we weren't fully aware of all of the bills that Sarah had received before we received them from you/her." On Friday, Rutland Regional again declined to discuss Witter's account. Witter said she learned of the refund during a meeting, at Rutland Regional's invitation, with a hospital financial administrator. "They went through all the costs, and I guess treated it [the first surgery] more like it was a hospital service that was within my contract," she said. The administrator told her they had "reprocessed" the charges from her second surgery, but that her portion of the bill did not change, she said. One difference between the two surgeries was that the first one was conducted during a crisis after Witter was admitted to the hospital through the emergency room. Balance bills in those circumstances are the most difficult to justify because patients with injuries that require immediate care, such as a heart attack or car accident, are usually taken to the closest medical facility. Patients aren't in a position to figure out where the closest in-network alternative is. Neither Witter's hospital nor her insurer budged on her underlying complaint: that she shouldn't have had to pay for second surgery, which cost $43,208, because one of the plates — known as a bone fixation device and manufactured by Johnson & Johnson's DePuy Synthes — broke. Device manufacturers generally don't offer warranties for hardware devices once they have been implanted, saying that device failure can be a result of a variety of factors beyond the company's control. Those include poor implantation by the surgeon; bones that fail to heal and subject the device to unremitting strain, causing metal fatigue; or patients who apply too much weight or movement on the bone despite instructions not to. DePuy, which declined to comment for this story, said earlier that device failures occur in "rare circumstances." In its instructions for surgeons, DePuy noted: "It is important to note that these implants may break at any time if they are subjected to sufficient stresses." Witter said her surgeon was present at her meeting at Rutland Regional and told her that "the fact the bone hadn't completely healed yet was part of the problem." She said she hasn't been able to find a contact for the device manufacturer so she can complain about its breaking. Even after she receives her refund, Witter still will have paid $12,084 for her broken limb. Asked her advice for other patients dealing with bills they consider excessive, she said: "Don't break your leg." Do you have an interesting or outrageous medical bill you'd like KHN and NPR to take a look at? Tell us about it here.